The theme is courtesy of Lisa of The Write Stuff. I'm not quite longing for winter. Not yet. It IS still Friday here, although just barely. that have left a link for this week. has found herself lost and alone in a snowstorm. Freezing cold without her coat. trudging through the snow, would you let me know? go see all of the ICY entries at Inspiration Avenue. Ooooh I love her. I wish I was walking in the snow with her! I don't think she is lost at all. I think she is remembering summer and giving thanks for the snow! Very nice! Even with all of this heat I'm not ready for winter yet...but she looks ready! she's so gorgeous, sorry she's lost! You've captured the icy theme so well. I LOVE this, such a clever idea! This is an amazing piece. I can feel the cold air and snowflakes swirling around. I think she has fallen in love with a snow fairy and she wants to be with him but must determine if she can change and is not so sure... Oh how love makes us do things we are not sure of.. Beautiful painting. Oh, that poor little fairy... She looks sooo cold. I hope she finds her way back home to the warmth. Fabulous! You captured "icy" so well! I'm sure not ready for that kind of storm yet. Now look Maggie, I don't mean to complain or anything... but seriously have you ever been to the UK? Rain, cold... we are still waiting for Summer to arrive round these parts. I can tell exactly why your fairy is lost - she is here... in England... expecting balmy summer days and being sadly disappointed!! Maggie this is very beautiful, delicate and gentle - it definitely feels like a scene from a fairy-tale. this is truly wonderful, she's so cute and the icy wind is so real. I think she was sleep walking and just woke up here on a cloud in the cold, but she just needs to drift on down, down, down and she'll be back to warmer temps and happy skies in no time! I know I'm late getting here this week, but I've been offline most of the week with a house guest. You were right about the IA entries cooling me down. It has helped a bunch. When I first saw you darling fairy, I didn't think of her as lost, but contemplative. I bet she's happy to be in the snow about now, or maybe it's just me, since I'm sweltering in my part of the world. A very sweet piece and just perfect for the icy theme! Love all the movement in the background. It looks so blustery and cold! Love this painting. Wouldn't it be nice if we had Winter outside one door and Summer outside another, and we could have a taste of each whenever we wanted? She is superb! I can taste the chill in your work. Love it! HAPPY PPF! 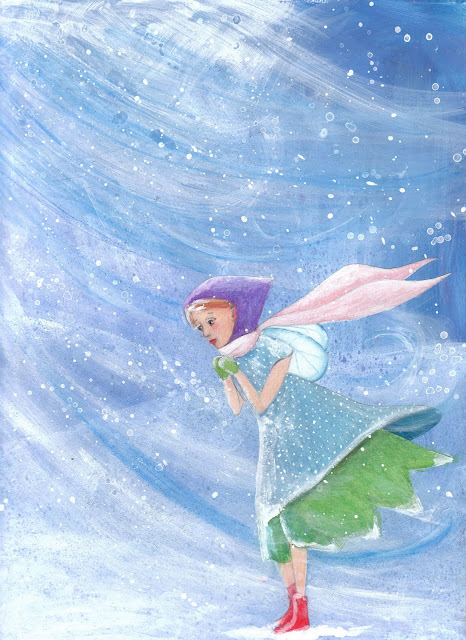 just lovely - i can feel the icy air in this illustration...so well done! Wow, Maggie! I'm making my rounds in blogland to give my heartfelt thanks for your sweet comment ~ your support is always priceless! I have to tell you though, this painting stopped me in my tracks ~ it's AMAZING!! You know you should be illustrating children's books ~ RIGHT?? Gorgeous, gorgeous, gorgeous!! This is beautiful!!! I can really feel her coldness by her expression! Well done!Happy PPF just a little late this week! What a beautiful piece Maggie!! No heatwave here in UK, some sun, lots of rain not much of a summer for us and we have cold weather to look forward to soon too! !